Wash and hull fresh ripe strawberries. Cut it in to small pieces and transfer it to a bowl. Add a tablespoon of sugar and give a quick mix. Cover it and allow it to sit for 2-3 hours/ overnight in the refrigerator. Strawberries will become tender and juicy. Simmer the tender strawberries in a pan with ¼ cup of water for 20-25 mins in low flame. Mash it well with a spatula and allow it to cool. Once cooled transfer the contents to the blender with ¼ cup of water and puree the cooked strawberries. Filter the puree to remove any chunky pieces. Preheat oven to 350 F. Grease or line the two 6” pans. Cut the butter in to pieces and allow them to sit at room temperature. Break open the eggs in a bowl and keep it ready. In a mixing bowl , take 1/4 cup of strawberry puree and milk whisk together well.Whisk egg one at a time and combine well. Now add vanilla extract ,red food color and combine well. In a large mixing bowl , sift cake flour , baking powder and salt. Mix well using hand mixer or spatula. Toss in softened butter and mix until it bread crumbs like texture. Slowly add the wet ingredients into the dry ingredients little by little. Pour the batter equally into two 6" cake pans. The mixture will not be runny and it will be difficult to spread. Don't use spoon to spread it, instead drop the pans on the counter multiple times to level the batter. Bake it at 350 degrees for 25-30 mins or until a skewer inserted comes out clean. Once done cool it on a wire rack and cover with plastic wrap freeze it for overnight. Add sifted powdered sugar, heavy cream, salt and vanilla extract and mix it for couple of mins. Trim the edges and level the cake. Place one layer of cake on cake board trimmed edge facing down. 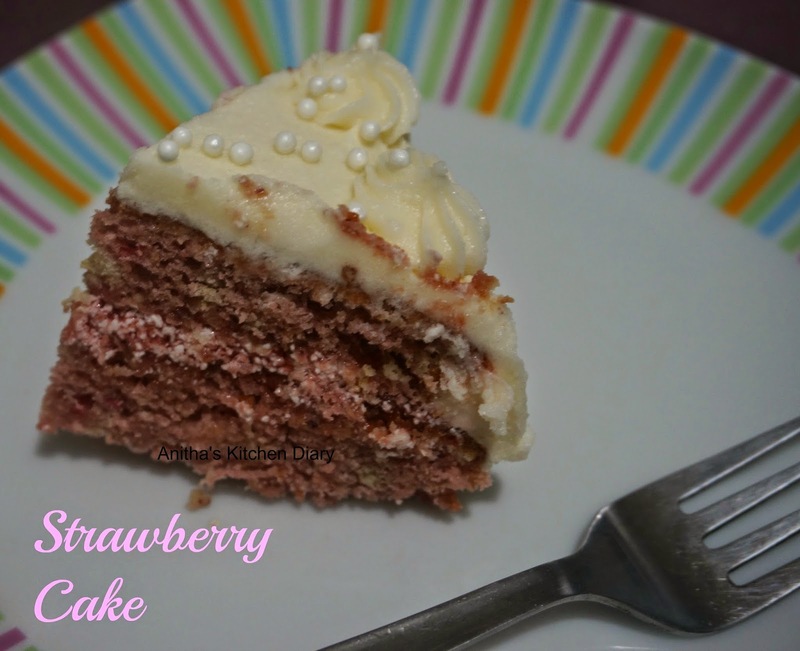 Add tablespoon of strawberry puree to 1/4 cup of frosting. Mix it and spread it on the top of the first layer of cake.Stack another layer. Add 1/2cup of frosting on the top and spread it evenly on the top and sides.Make sure the cake is fully covered with frosting. This is called crumb coat.Let it sit in fridge for an hour. 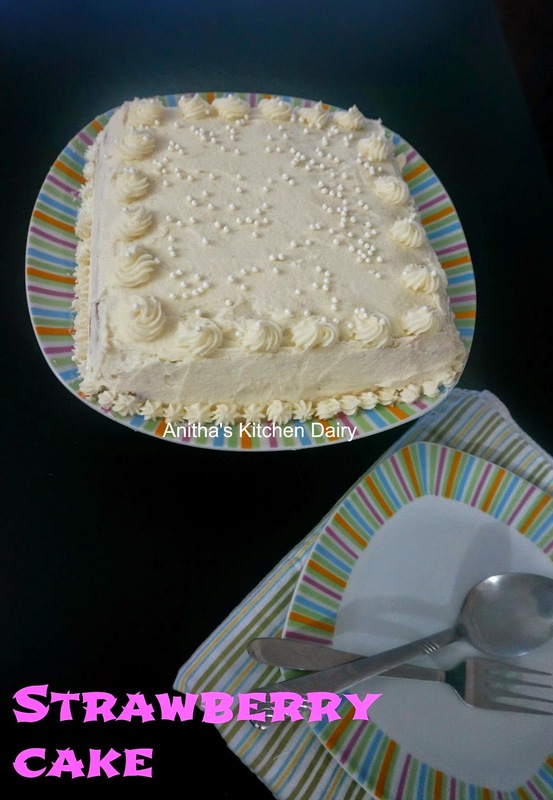 Remove the cake from fridge and add generous amount of frosting on top and sides. Spread the frosting evenly. Fill the piping bag with frosting and insert start tip and start decorating on top of the cake. Sprinkle some edible beads on top . If you don't have cake flour, you can prepare your own by substituting with all purpose flour and corn starch. 1 cup cake flour = 1 cup of APF + 1 tbsp of Corn flour. Linking this recipe to bake fest event # 36 Happening @ my space.